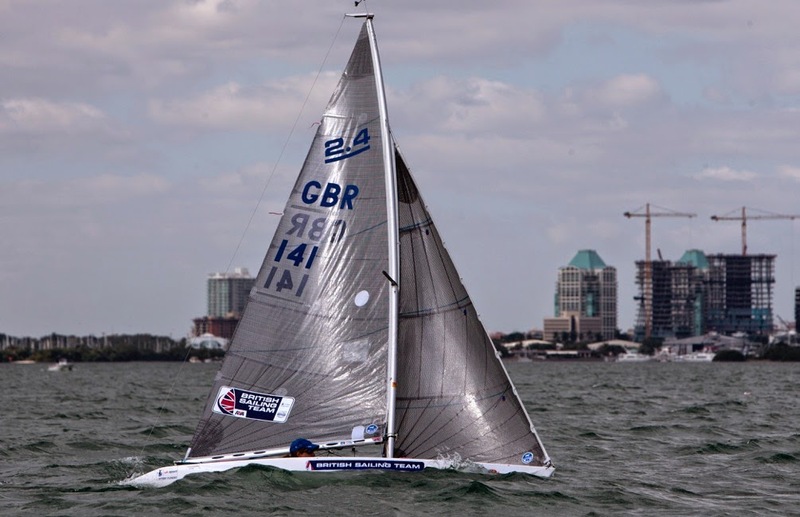 Giles Scott and Bryony Shaw sealed early World Cup victories in Miami on Friday (30th January) with the British Sailing Team also claiming two silver medals as Paralympic Classes racing drew to a close on a painfully light windy day on Biscayne Bay. Finn star Scott extended his dominance in the heavyweight dinghy class to defend his 2014 ISAF Sailing World Cup Miami crown and add another title to his 15-month winning run, while Shaw also amassed an unassailable lead to continue her form in the RS:X women's windsurfing class. Friday's forecast promised a decaying breeze as the day went on, with the 10am starters certainly enjoying the best of the light wind conditions. The Finn fleet managed their scheduled two races just before the wind shut down, with Scott winning the first of them and finishing fifth in the second with Australia's Jake Lilley - his closest rival heading into the day - finishing deep in the pack. It was enough to see the World and European Champion go into the final day with an insurmountable 23-point lead. "It feels very good to be able to round off the racing this morning and have a 23-point lead and not have a stressful day tomorrow!" the 28-year-old admitted. "It was a difficult day today/ We were kind of lucky in that we were on so early so we got the morning breeze. It was very light, very shifty, so to be able to continue the sort of consistency I've had all week is great to have done." With gold already in the bag, those thinking Scott will take his foot off the gas for tomorrow's medal race may need to think again, with the Weymouth sailor stating: "Hopefully I can round the week off well tomorrow." Shaw has certainly found her groove as she also looked to defend her title from this event 12 months ago. Counting no worse than a fifth place across her 11 races heading into Friday's penultimate day, the 31-year-old pumped her way to a second and a fourth in the two light wind races the class managed, and turned her 21-point lead at the start of the day into a 33 point margin by the end of it. The Weymouth sailor was delighted to claim gold with an impressing all-round performance amid some tricky conditions at this season-opening event. "We've had a really mixed week of wind and today has been the lightest so it's been much more like a game of chess I would say. I've been trying to stay in touch with my closest rivals. The wind's been really tricky with an offshore breeze so we're really having to play the percentages. I did that well in the two races [today]," said Shaw of her display on Friday. "Considering we've had all winds from 25 knots down to five it's been a really broad-ranging week and i think that's played to my strengths. Every day I've been edging that points gap bigger and bigger so I've been pleased to start off the year well. "Miami was a target regatta for me and it's important to kick-start the year on a high with a view to trying to get medals at the next Olympic Games. It's important to start winning now and try to keep that momentum going." Friday was the final day of competition for the three Paralympic Classes, but racing proved impossible as what little breeze there was diminished. It left 2.4mR sailor Megan Pascoe and the SKUD Alexandra Rickham-Niki Birrell without the opportunity to upgrade their silver positions into golds, with the Sonar trio John Robertson, Hannah Stodel and Steve Thomas finishing just a point outside of the medal positions after a false start penalty saw them drop to fourth on Thursday. Although frustrated with her own false start on Thursday, Pascoe was content with her performance this week. "Another World Cup medal - I think that means I've won a medal at every EUROSAF and World Cup event for the past two years, so happy days!" the Portland-based sailor enthused. "It's been a really tough week actually so I'm really happy to come our of it with silver. I was really happy with how I was going yesterday boat speed-wise. I struggle in that 10-13 knots usually so i'm really happy that I made a gain there actually. There have been ups and downs [with the OCS] but it's quite a long year to come with hopefully a few more medals." Rickham and Birrell were also frustrated to not get racing on Friday to try and reel in the Australian SKUD leaders, but Rickham was philosophical after a challenging week. "We're always happy with a medal - not so happy with the colour, but nothing new here. It's a bit frustrating as we'd have liked to have had the chance to go out and battle it out with the Aussies and maybe try and get our hands on the extra shiny one. "It's been a difficult week across the board," she continued. "There have been really a range of results in all of the fleet just because it's been so shifty, breeze up, breeze down but out scoreline's been pretty consistent - the most consistent in our fleet other than a small blip. "We can't really be disappointed. We tried out a few new things -some of them worked and some of them really didn't! That's just how it goes." Saturday will see the medal races for the ten Olympic classes, with 14 British boats set to feature in the final day action. It's a straight showdown between Nick Thompson and Germany's Philipp Buhl for the Laser gold. With neither sailor able to finish worse than second and with Thompson just one point ahead going into the double-point race, whoever finishes in front on the water will take the title on Saturday. No racing was possible ont he 470 course today. Luke Patience and Elliot Willis are now assured of their first World Cup medal together, at least a silver, and take a 15 point lead over Australian World Champions Mat Belcher and Will Ryan into tomorrow's 10 boat finale. Hannah Mills and Saskia Clark sit in silver medal position going into the 470 Women's medal race, with Sophie Weguelin and Eilidh McIntyre, currently fifth, also able to push into the podium spots, while Ben Saxton and Nicola Groves are looking to hold the silver medal position in the Nacra 17 fleet. Gold is out of reach with the Italian crew stretching out their lead. 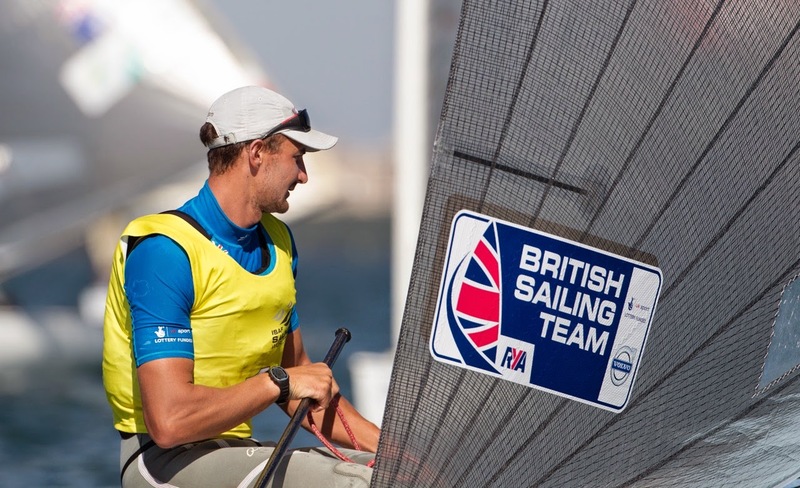 Both John PinkStuart Bithell and Dylan Fketcher-Alain Sign will be hoping to push into the 49er medal positions in tomorrow's race where the fight for bronze will be close. 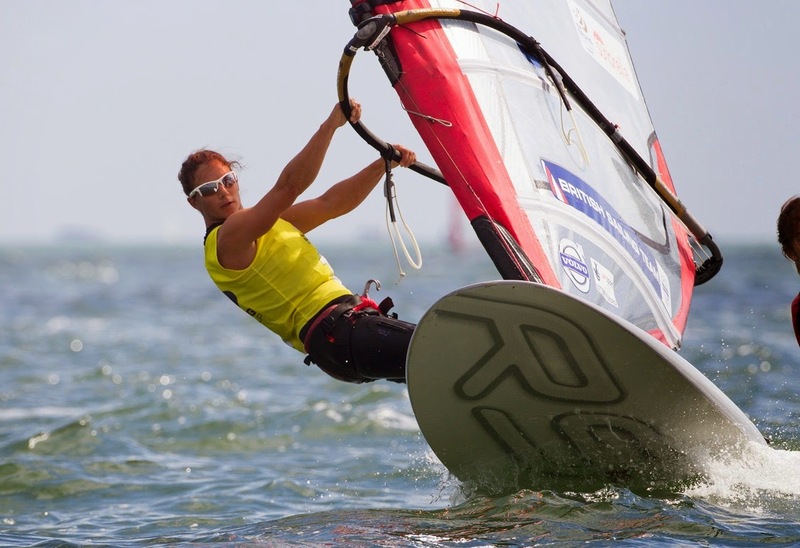 Alison Young and Nick Dempsey are into their respective Laser Radial abd RS:x Men's finals in fifth position, while Charlotte Dobson and Sophie Ainsworth have made the cut in the 49erFX event in 10th place.